Once upon a time there was a magnificent waterfall in Sweden called Storforsen (The grand rapids). It was as admired for its beauty as it was dreaded by the log floaters. One night unlike any other the noise from the rapids where silenced forever. 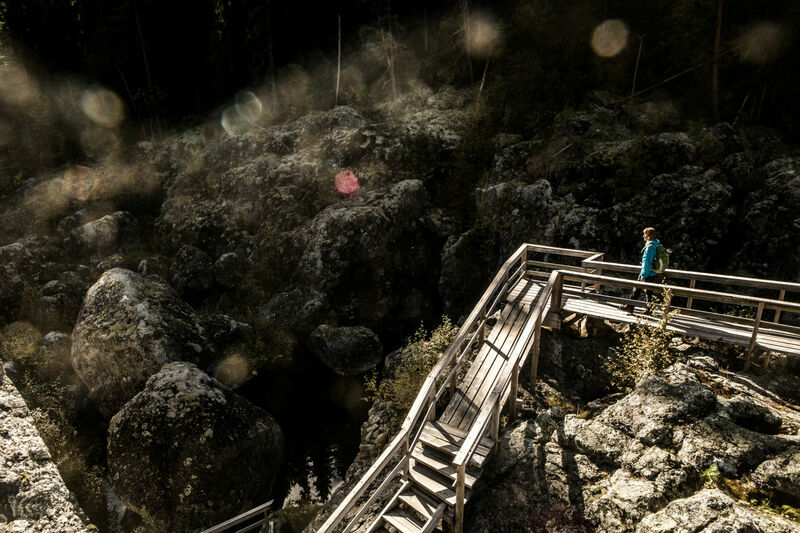 The work of one man and nature together created the heritage site Döda fallet – the dead falls. It has been called the largest natural disaster facilitated by a man in modern times. Where the grand rapids once created an enormous audio mass there is now a desolate landscape, only a few birds are heard. As a visitor you feel really small amongst the large boulders and giant potholes caused by swirling stones caught for ages in pockets of rock in the rapids. Some surfaces are made smooth from all the years in water. The emptied waterfall is bordered by green forest on both sides. A visit to the dead fall gives you a strange, calm, yet loaded feeling. It´s a disaster that resembles an art exhibition, a giant installation if you like. The story is dramatic. The grand rapids connected Lake Ragunda to the Indalsälven river and was dreaded by the timber workers trying to get loads of timber undamaged to the swedish coast for further shipments. The plan in 1796 was to dig a bypass canal for floating the timber securely, instead of having them break and get stuck in the 30 meter high waterfall (the Niagara falls is 51 metres high to give you some perspective). A daring work was led by merchant Magnus Huss. He used water from a stream and created ponds to let the overflow water create its own path around the rapids. Slowly, the water began to take a new direction. As spring progressed the melting snow helped in the process and from one day to the other the Grand Rapids literally became the Dead Falls overnight on June 6th in 1796. The rising water pushed through the dam, and drained Lake Ragunda completely as the entire river was redirected straight through the forest. The total devastation was a fact. Farms, livestocks and sawmills miles along the shores of the river where lost in a process that lasted less than 4 hours. Miraculously no human lives were taken by the gigantic flood wave. It looks like the devil himself went through with a snowplow, the policeman of the area said when he looked out that morning. Now Magnus Huss got his nickname the “Crazy Huss” and a mob of angry farmers eagerly sought for him leaving him running for his life. One year later he was found drowned in the river. In the following trial after the disaster no one was found guilty. Experts claimed the water would have broken through sooner or later because of the geological structure of the area. It is peaceful today when one is visiting the Dead Falls and it is easy to imagine the grandeaur of the once roaming falls. 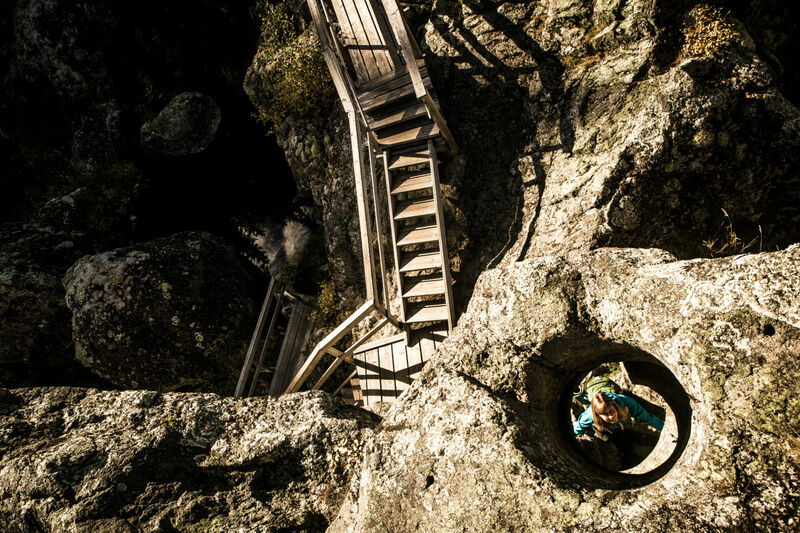 On rustic and impressive wooden walkways you can take a comfortable tour to see the boulders and potholes up close. There are some deep dark green holes filled with water in some places mirroring the surrounding pines. Information boards tells the story of that unlikely night some 200 years ago when the water took another way. There is a nature path leading into the forest with information on flora and fauna. Do not be surprised if you happen to see the bats of the nature reserve encompassing the dead falls area. The large rotatable platform was made for musical and theatrical shows with the dead falls as a magical backdrop. Over the years there has been performances here like the story of the Crazy Huss and Shakespeare´s A Midsummer Night´s dream. Turn off road no 87 between Hammarstrand and Bispgården. Follow the signs to the large parking lot. Hike on wooden walkways some 350 meters down along the dead falls. There are several pic nic areas, one with a roof. The first part of the walkways is made accesible for wheelchairs, prams and walkers. Further down along the emptied riverbed there are stairs and a nature path into the forest. There are guided tours for groups in summer. There are also guided canoe trips along the Indals river (Indalsälven). The Cafeteria by the parking lot is open from May to August serving coffee, ice cream and lunches. There are hotels, cabins and hostels nearby. 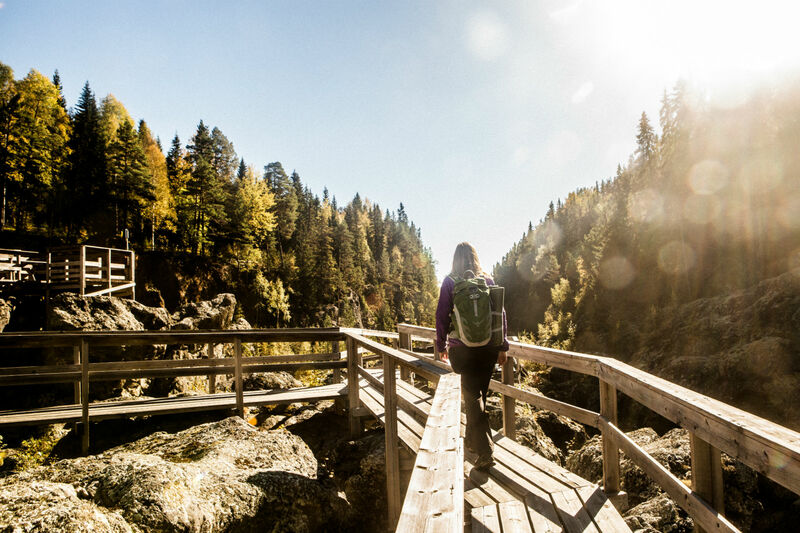 The area around Döda fallet is a nature reserve with cultural history and nature worth protecting with unique geological formations. In the area there is also an old mine shaft and a 5 300 year old sleigh has been found here. There is an ongoing work with the purpose of making the area a UNESCO World Heritage Site. In spite the small size of the nature reserve there are lots of botanic treasures. There are 150 species of moss east of the fall. And there is rare lichens like the Ramalina Thrausta and vascular plants like Impatiens Noli-Tangere. Professor Gerhard De Geer used the empty lake Ragunda with the layers of sediment to study the growth of the landscape. In the beginning of the 20th century he managed to date the ending of the last ice age. The remarkable area by the dead falls invites to contemplation. 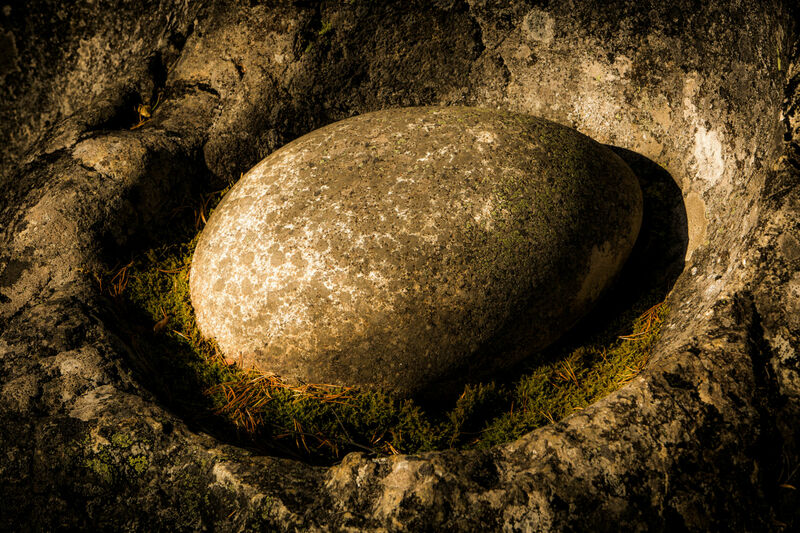 Take your time and enjoy the peace by the boulders and deep dark green pools mirroring the surrounding tree tops.